The first official builds of Chromium-based version of Microsoft Edge are now available to download, and Microsoft has also launched the Microsoft Edge Insider Addons website. Anyone using the standard, non-Insider version of the browser is probably familiar with the addons and extensions that are available from the Microsoft Store for Edge. But with the new Chromium version of Edge, the new website gives an easy way to extend the capabilities of the Dev and Canary builds. 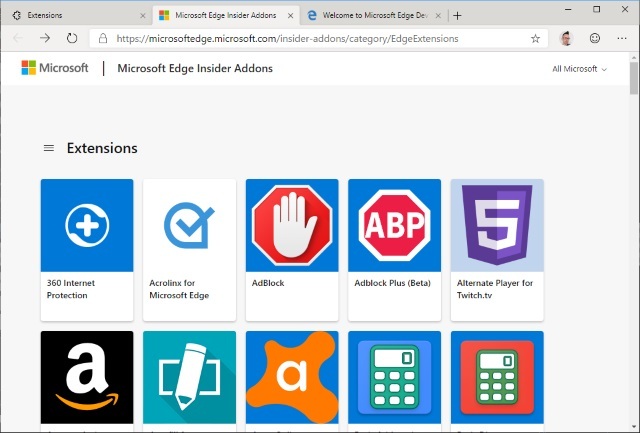 As these Insider builds of Edge are based on Chromium, it should come as no surprise that the Microsoft Edge Insider Addons website bears more than a passing resemblance to the Chrome Web Store. Select Extensions and then click either the Microsoft Store link or Get extensions from the Microsoft Store. You can then simply scroll through the list to browse the selection of addons, or you can drill down to certain types of addons by click the hamburger menu (three lines) to the left of the Extensions heading. Click the Get button to install anything that takes your fancy. While the is not a huge selection available at the moment, hopefully it will expand over time.